Neo-Hebraic word designating the president or the trustee of a congregation. It is found in the Targum as the equivalent of words which are interpreted as "steward" (see Isa. xxii. 15; Zech. xi. 3), and it is frequently met with in Talmudic literature. Mussafia (in "Musaf he-'Aruk," s.v.) derives it from the Greek, thinking evidently of either πρόνηος, which may be a synonym of ἄρχων τῆς συναγωγῆς = "ruler of the synagogue" (Luke viii. 41), or of πρόνοιος = "one who provides." Kohut ("Aruch Completum," s.v.) suggests πύρνος. In some modern languages it is accepted as a legal term; e.g., it occurs as "barnos" in the Bavarian edict of June 10, 1813 (§ 30; see Heimberger, "Staatskirchenrecht, Stellung der Juden in Bayern," Freiburg-in-Breisgau and Leipsic, 1893; Grünbaum, "Das Erbtheil der Väter," Ansbach, 1842; Kaufmann, "Aus Heinrich Heine's Ahnensaal." p. 42, Breslau, 1896). In Dutch legislation, at least since Napoleonic times, it is found as "parnassijns" ("Allg. Zeit. des Jud." 1867, pp. 896, 933). In medieval times the title does not seem to have been usual. The Judenschreinsbuch of Cologne, which contains many Hebrew documents of the thirteenth and fourteenth centuries signed by the trustees of the congregation in their official capacity, does not show this title at all. It is very rare in the old memor-books, only one mention being found in the memor-book of Worms, 1349 (Salfeld, "Martyrologium," p. 75), while the title of "rabbi" occurs there very frequently. The word occurs, however, as a surname in England (Jacobs, "Jews of Angevin England," p. 371). On the tombstones of Prague "parnas" is rarely found, and then always in addition to such synonyms as "manhig," "gabbay," "primus," "alluf," "ḳaẓin" (see Hock-Kaufmann, "Die Familien Prags," Presburg, 1892, passim). On the tombstones of Frankfort-on-the-Main the first mention occurs in 1539, which is hardly accidental, although of old tombstones comparatively few have been preserved, and these have very brief inscriptions. In Talmudic sources the parnas is evidently both the religious leader and the administrator of the community. The clearest statement is the following: "Who is a scholar, worthy of being appointed as parnas of the congregation? He who is asked about a law from any source—even if it were from the tractate of Kallah—and who answers" (Shab. 114a). Similarly the Talmud speaks of privileges conceded to the sons of scholars who were appointed as parnasim of the congregation (Hor. 13b; Shulḥan 'Aruk, Yoreh De'ah, 244, 17). In the same sense are to be understood passages like Ta'an. 9a, where Moses, Aaron, and Miriam are mentioned as ideal parnasim, and Yoma 86b, where Moses and David are similarly cited. The report that R. Akiba had been appointed parnas of the congregation (Yer. Peah 21a), even if legendary, shows that at the time when this story was recorded it was customary to elect a prominent scholar as leader of the congregation. This must have been the rule down to the fifteenth century; for the signatories to the charter given to the Jews of Speyer in 1090, Judah ben Kalonymus, David ben Meshullam, and Moses ben Jekuthiel ("Zeitschrift für Geschichte der Juden in Deutschland," i. 128), are in all likelihood identical with the authors of piyyuṭim. The signatures of the rabbis to the documents in the "Judenschreinsbuch" attesting congregational transactions, the designation of the recognized congregational representative as "bishop of the Jews," "rabbino mor," etc., as well as the Oriental custom of combining the leadership in religious with that in secular matters, would prove that the parnas was a rabbinical scholar placed in charge of the congregational affairs. The meagerness of the sources on the constitution of congregations renders it very difficult to accurately specify the rights and the duties of the parnas. He was most likely appointed as such in olden times by the nasi (Yer. Yeb. 12a; Grätz, "Gesch." 3d ed., iv. 197; Weiss, "Dor," iii. 95 et seq. ), receiving a diploma, "iggeret reshut" (Ḥag. iii. 3; see Tos. Yom-Ṭob; Ḥag. 18b; and Rashi and R. Nissim ad loc. ); this seems to be proved by the expression (Ḳid. 70a). At the same time this appointment was in some way ratified by the people (Ber. 55a). 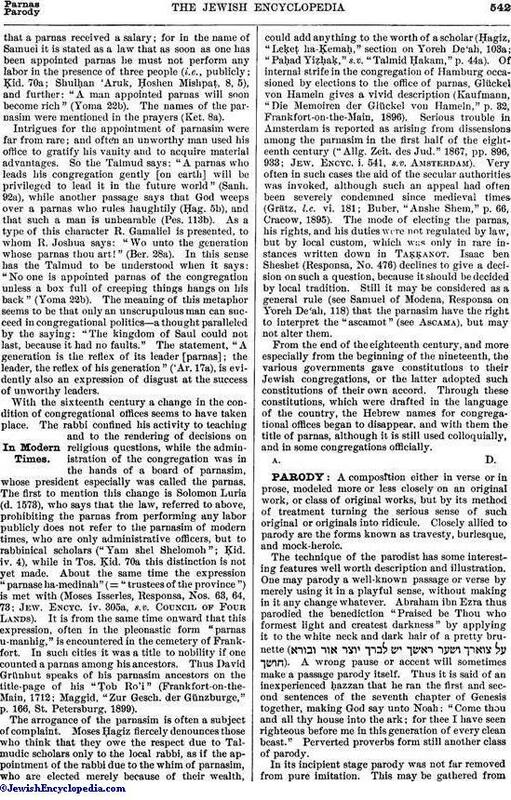 Larger congregations as early as Talmudic times were administered by a board of parnasim; this appears not only from the comparison with Moses, Aaron, and Miriam, already quoted (Ta'an. 9a), but more clearly from the law that two brothers might not hold the office of parnas (Yer. Peah 21a), which presupposes that they would have to officiate at the same time. Among the privileges accorded to the parnas it is mentioned that he is called to the Torah after the Kohen and Levi, which means the first after those of priestly rank (Giṭ. 60a; Shulḥan 'Aruk, Oraḥ Ḥayyim, 136). It would also appearthat a parnas received a salary; for in the name of Samuel it is stated as a law that as soon as one has been appointed parnas he must not perform any labor in the presence of three people (i.e., publicly; Ḳid. 70a; Shulḥan 'Aruk, Ḥoshen Mishpaṭ, 8, 5), and further: "A man appointed parnas will soon become rich" (Yoma 22b). The names of the parnasim were mentioned in the prayers (Ket. 8a). Intrigues for the appointment of parnasim were far from rare; and often an unworthy man used his office to gratify his vanity and to acquire material advantages. So the Talmud says: "A parnas who leads his congregation gently [on earth] will be privileged to lead it in the future world" (Sanh. 92a), while another passage says that God weeps over a parnas who rules haughtily (Ḥag. 5b), and that such a man is unbearable (Pes. 113b). As a type of this character R. Gamaliel is presented, to whom R. Joshua says: "Wo unto the generation whose parnas thou art!" (Ber. 28a). In this sense has the Talmud to be understood when it says: "No one is appointed parnas of the congregation unless a box full of creeping things hangs on his back" (Yoma 22b). The meaning of this metaphor seems to be that only an unscrupulous man can succeed in congregational politics—a thought paralleled by the saying: "The kingdom of Saul could not last, because it had no faults." The statement, "A generation is the reflex of its leader [parnas]; the leader, the reflex of his generation" ('Ar. 17a), is evidently also an expression of disgust at the success of unworthy leaders. With the sixteenth century a change in the condition of congregational offices seems to have taken place. The rabbi confined his activity to teaching and to the rendering of decisions on religious questions, while the administration of the congregation was in the hands of a board of parnasim, whose president especially was called the parnas. The first to mention this change is Solomon Luria (d. 1573), who says that the law, referred to above, prohibiting the parnas from performing any labor publicly does not refer to the parnasim of modern times, who are only administrative officers, but to rabbinical scholars ("Yam shel Shelomoh"; Ḳid. iv. 4), while in Tos. Ḳid. 70a this distinction is not yet made. About the same time the expression "parnase ha-medinah" (= "trustees of the province") is met with (Moses Isserles, Responsa, Nos. 63, 64, 73; Jew. Encyc. iv. 305a, s.v. Council of Four Lands). It is from the same time onward that this expression, often in the pleonastic form "parnas u-manhig," is encountered in the cemetery of Frankfort. In such cities it was a title to nobility if one counted a parnas among his ancestors. Thus David Grünhut speaks of his parnasim ancestors on the title-page of his "Ṭob Ro'i" (Frankfort-on-the-Main, 1712; Maggid, "Zur Gesch. der Günzburge," p. 166, St. Petersburg, 1899). The arrogance of the parnasim is often a subject of complaint. Moses Ḥagiz fiercely denounces those who think that they owe the respect due to Talmudic scholars only to the local rabbi, as if the appointment of the rabbi due to the whim of parnasim, who are elected merely because of their wealth, could add anything to the worth of a scholar (Ḥagiz, "Leḳeṭ ha-Ḳemaḥ," section on Yoreh De'ah, 103a; "Paḥad Yiẓḥaḳ," s.v. "Talmid Ḥakam," p. 44a). Of internal strife in the congregation of Hamburg occasioned by elections to the office of parnas, Glückel von Hameln gives a vivid description (Kaufmann, "Die Memoiren der Glückel von Hameln," p. 32, Frankfort-on-the-Main, 1896). Serious trouble in Amsterdam is reported as arising from dissensions among the parnasim in the first half of the eighteenth century ("Allg. Zeit. des Jud." 1867, pp. 896, 933; Jew. Encyc. i. 541, s.v. Amsterdam). Very often in such cases the aid of the secular authorities was invoked, although such an appeal had often been severely condemned since medieval times (Grätz, l.c. vi. 181; Buber, "Anshe Shem," p. 66, Cracow, 1895). The mode of electing the parnas, his rights, and his duties were not regulated by law, but by local custom, which was only in rare instances written down in Taḳḳanot. Isaac ben Sheshet (Responsa, No. 476) declines to give a decision on such a question, because it should be decided by local tradition. Still it may be considered as a general rule (see Samuel of Modena, Responsa on Yoreh De'ah, 118) that the parnasim have the right to interpret the "ascamot" (see Ascama), but may not alter them. From the end of the eighteenth century, and more especially from the beginning of the nineteenth, the various governments gave constitutions to their Jewish congregations, or the latter adopted such constitutions of their own accord. 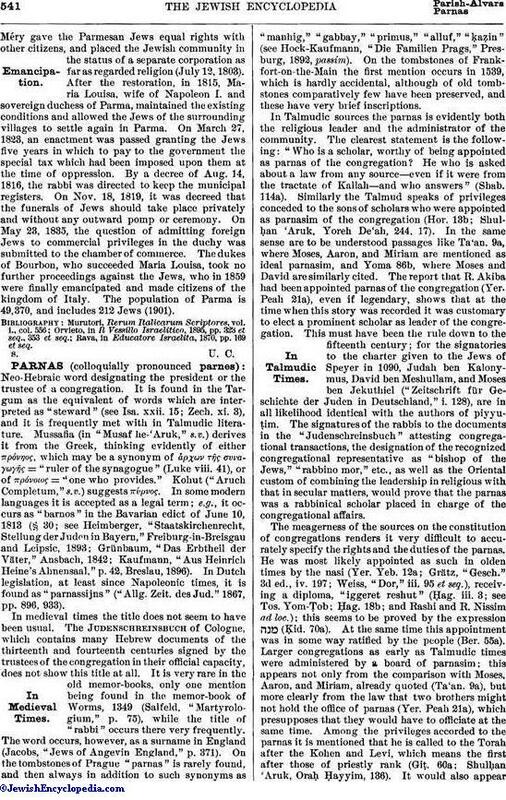 Through these constitutions, which were drafted in the language of the country, the Hebrew names for congregational offices began to disappear, and with them the title of parnas, although it is still used colloquially, and in some congregations officially.